Sorry I haven’t been around for a while…anyway, here’s a little story for you. You may get bright ideas for your own garden, I don’t know, but I do – I call them ‘visions’. Sometimes they work and sometimes they are dismal failures. I have yet to see if this particular one is successful! I’ll start at the beginning – the best place to start, of course! When we moved to this house, there were several mature trees here. One of them was a tall Silver Birch, in the middle of the large front lawn. As you can see, it was tall and not really a very good shape for a garden. I say ‘was’ because we always had a plan to remove it, but years went by and we kind of got used to it. 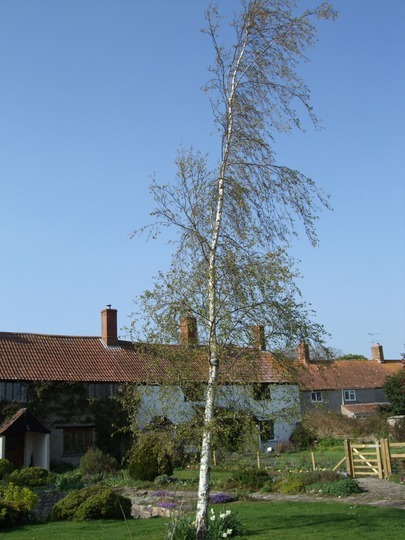 We did plant a group of three birches quite close to it, with the idea that when they grew up, silver birch no. 1 would go. My husband looked at it last month and asked if I thought I was ready to say ‘goodbye’ to it. Well, I was. He felled it quite easily, BUT – that left an ugly stump. Now comes my ‘vision’. I thought a lovely large pot full of flowers would make a feature in its place, so I started looking. None of the Garden Centres had anything suitable, so we made a trip to a very large Reclamation Yard. 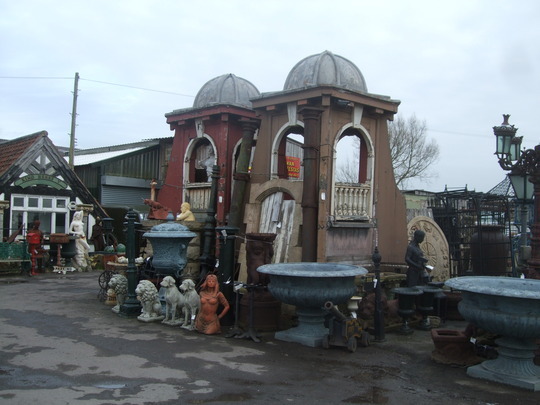 My goodness – 5 acres of the most amazing items, some of which would need a crane to move! I rather liked this ‘font-like’ stone edifice. I could imagine that with plants in it. However, although I gazed at it for ages I decided it just wasn’t quite right and it would be a nightmare to move it and get it installed. Would this gothic urn look good? Hmmm… possibly. 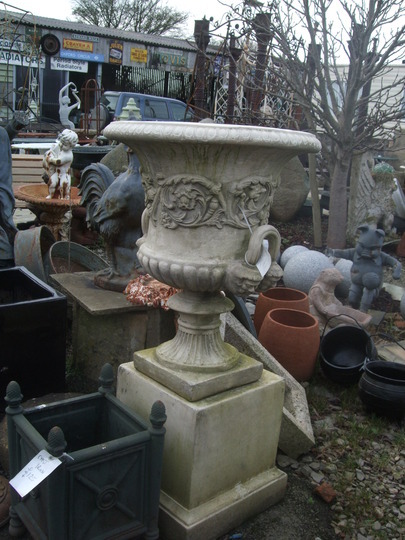 Then I spotted a pedestal – right in the middle of a lot of other things, and a pot – several feet away from it. Would they ‘match’? The owner of the yard was wonderful – he got his sack truck and shifted the pedestal across the yard to the pot, which was lifted on top. YES!! They matched! At home, we got the pot and placed it on top of the stump. I loved it – I could visualise the pot on its pedestal surrounded by a small area of paving to show it off, with a trailing rose and Clematis mingling. 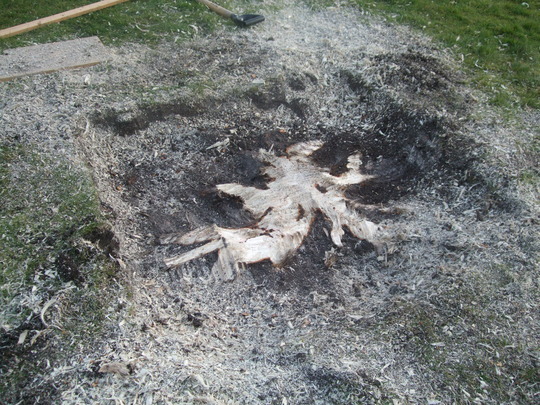 But first there was the not – so – small problem of the stump. 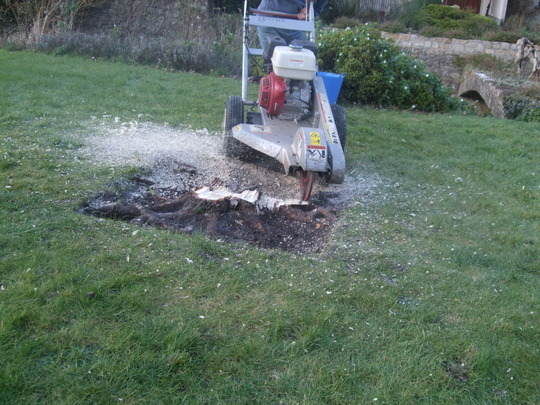 We hired a stump grinder for a day. That got the stump down to below ground level. 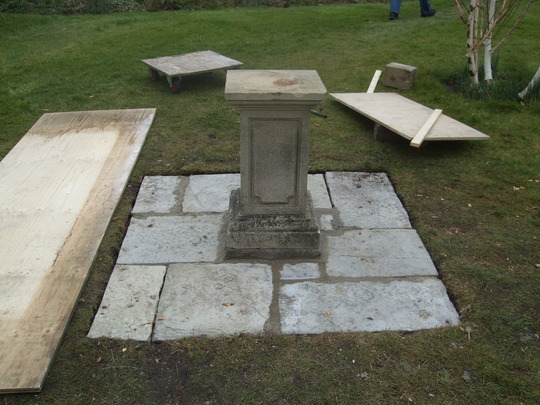 We had collected enough old slabs from the Yard (like the ones we used when we extended our front path) to make the plinth. 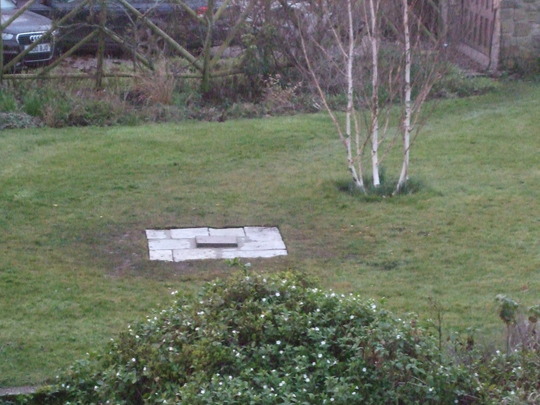 From the upstairs window you can see the other silver birches and the plinth in place. 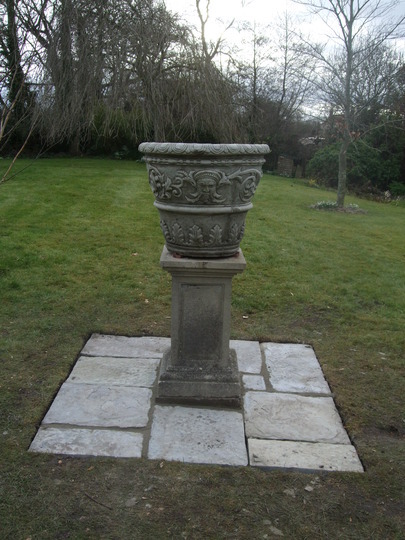 Next was the very difficult task of moving an extremely heavy pedestal across the garden into position. 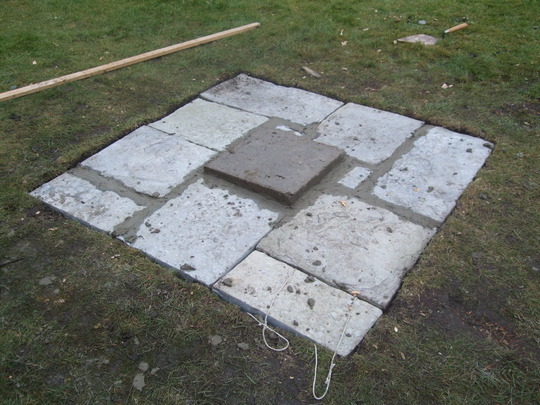 Fortunately my husband is very resourceful, and with the aid of a borrowed sack truck we got it into its place in the middle of the square of slabs. The pot wasn’t a problem, and here it is, perched on the pedestal. So what was my ‘vision’? Well, I have filled the pot with a mixture of J.I. 3 and home made compost, and I’ve planted a rose called ‘The Fairy’ and two Clematis ‘Edda’. My vision is for a pot full of pink roses mingling with purple Clematis flowers all spilling over the edge. I wonder if it will work? Previous post: RICHARD = red. Next post: Sad and happy. What a fascinating journey Spritz, thanksfor sharing ? Yes it will be interesting to see it end of summer attractive but lonely is how it looks to me now. Don't you just love it when a "plan" comes to fruition. I loved that reclamation yard too. Aren't stumps a pain. Like your solution. Keep up the watering of the urn. When we cut down the Cratagus x prunifolia in our back garden, we left a 12" high stump, bucket size circumference, unable to get any more out, I moved 'Siris' statue onto the resulting 'plinth', but it is gradually decaying. A grinder would be a good idea, but am afraid of the mess it would make in the border. It was a good idea to get the grinder in. You've been able to turn the area into something really attractive. I never think of reclamation yards, what a good idea. This will be a real eye catcher and talking point now. I hope your clematis and Rose grow well for you and give you the display you dream of. The reclamation yard is a real treasure trove - so many desirables it must have been hard to choose. Your plinth is fantastic. I do hope your vision comes to life this summer. And its good to hear from you again - been wondering where you were. That is not a vision ......it is a dream come true. Sounds wonderful and looks perfect. Excellent.....a real front garden feature. I love to see Clematis trailing.I'm sure they'll make a spectacular sight. I love visiting our local reclamation yard. Like your OH mine is a perfect partner for a gardening spouse. Over the years he has made my gardening dreams come alive. I think your partnership produces wonderful solutions and I am looking forward to seeing the end result. So am I! I'm glad you like it. :-)) Brian, if I took a photo from the other direction looking towards the house I think you'd change your mind - it looks 'right' against the stone of the house - but I take your point about the liner. Too late now! well hello you, nice to hear/see you on here again. I really like your visions and you did well to spot it. That yard was amazing. I liked your birch but it was a monster wasn't it. Good old OH too. did he do the grinding? Will pm you soon with all our news etc........I love those yards they have so much stuff!! Peter wont take me, he knows what I am like !! Great minds, btw !! last year I filled the vase (in the centre of our small circular lawn) Peter bought me for Christmas with three trailing roses!! and a trailing Clematis, the roses were too young and so was the clematis, so nothing really happened.......point I am trying to make is.......be sure your roses are large and established for impact!! I know it might take a year or more to get established and I mustn't get impatient, but it's hard to wait for my 'vision' to become reality! Oh, I forgot to answer Brian - the pot measures 21" across and also in depth. An inspiring "journey" and an enjoyable one for you, Spritzhenry and for the reader. I know of several reclamation yards but have never visited one. That will be remedied now! Is the urn absolutely "solid"? Hate to be a elf and safety know-it-all and cast a damper on things, but an unsteady one can be dangerous, especially to a small child. Guess a boisterous dog could be a problem. Having said that, I love the appearance and the final vision will be worth waiting for. 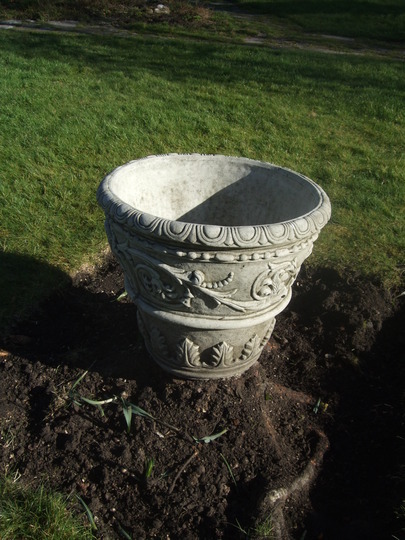 It is totally solid and safe, Eirlys, the pedestal is concreted onto the plinth and the pot full of compost is so heavy I certainly couldn't even try to lift it. We call them " Junk Yards" over where I'm at.....but.....if I saw the same items in one of them that I see in the one you visited I would call it a Reclamation Yard too. To roam around in one of these places and use one's imagination in how to turn a forlorn item off in a corner somewhere into a artistic centerpiece of attraction such as you did Spritz, is a most enjoyable thing to do. Of course it will work and it will look really beautiful. I loved seeing what you got up to and the decisions you made along the way. That pot is beautiful, and it looks good in situ. I'm sure this vision is going to be a huge success. Funnily enough I have recently had a yearning for some lovely moulded pots like this and have been planning a trip to our nearest junk yard. Its nothing like your reclamation yard...its full of junk. But sometimes you get a bargain, if you're lucky. And another place to find nice things for your garden is a concrete yard. The place we got our capstones for the gate wall made had loads of lovely garden things. I never would have thought of going to look there! You live and learn. How is the 'vision' shaping up spritz? I was wondering that. I do love container gardening. Still haven't visited a reclamation yard. Afraid if we do we'll fancy something and I am trying to de-clutter! 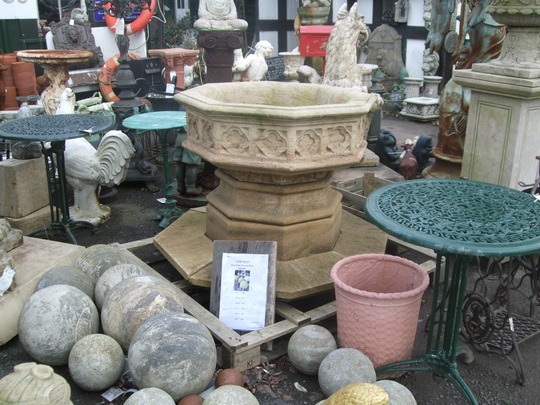 Your pedestal & pot idea look great, a real focal point. I love reclamation yards, we have one which often has those big tall chimneys with the fancy rik-rak tops but they are sooo expensive. I was wondering if the pot will be deep enough for 2 clems? The petunias are still going strong so my pot still looks lovely.